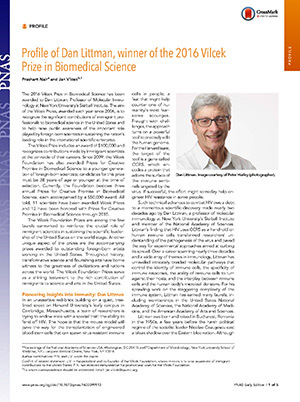 The 2016 Vilcek Prize in Biomedical Science has been awarded to Dan Littman, Professor of Molecular Immunology at New York University’s Skirball Institute. The aim of the Vilcek Prizes, awarded each year since 2006, is to recognize the significant contributions of immigrant professionals to biomedical science in the United States and to help raise public awareness of the important role played by foreign-born scientists in sustaining the nation’s leading role in the international scientific enterprise. The Vilcek Prize includes an award of $100,000 and recognizes contributions made by immigrant scientists at the pinnacle of their careers. Since 2009, the Vilcek Foundation has also awarded Prizes for Creative Promise in Biomedical Science to a younger generation of foreign-born scientists; candidates for this prize must be 38 years of age or younger at the time of selection. Currently, the Foundation bestows three annual Prizes for Creative Promise in Biomedical Science, each accompanied by a $50,000 award. All told, 11 scientists have been awarded Vilcek Prizes and 12 have been honored with Prizes for Creative Promise in Biomedical Science through 2015. The Vilcek Foundation Prizes are among the few laurels earmarked to reinforce the crucial role of immigrant scientists in sustaining the scientific leadership of the United States on the world stage. Another unique aspect of the prizes are the accompanying prizes awarded to outstanding foreign-born artists working in the United States. Throughout history, transformative science and flourishing arts have borne witness to the greatness of civilizations and nations across the world. The Vilcek Foundation Prizes serve as a shining testament to the rich contribution of immigrants to science and arts in the United States. In an unassertive red-brick building on a quiet, tree-lined street on Harvard University’s leafy campus in Cambridge, Massachusetts, a team of researchers is trying to endow mice with a special trait: the ability to fend off HIV. The hope is that the mouse model will pave the way for the transplantation of engineered blood stem cells that can spawn virus-resistant immune cells in people, a feat that might help counter one of humanity’s most fearsome scourges. Fraught with challenges, the approach turns on a powerful tool to precisely edit the human genome. For the Harvard team, the target of the tool is a gene called CCR5, which encodes a protein that adorns the surface of the immune sentinels targeted by the virus. If successful, the effort might someday help engineer HIV resistance in some people. Such technical advances to combat HIV owe a debt to a momentous scientific discovery made nearly two decades ago by Dan Littman, a professor of molecular immunology at New York University’s Skirball Institute and member of the National Academy of Sciences. Littman’s finding that HIV uses CCR5 as a handhold on human immune cells transformed researchers’ understanding of the pathogenesis of the virus and paved the way for experimental approaches aimed at curbing its spread. 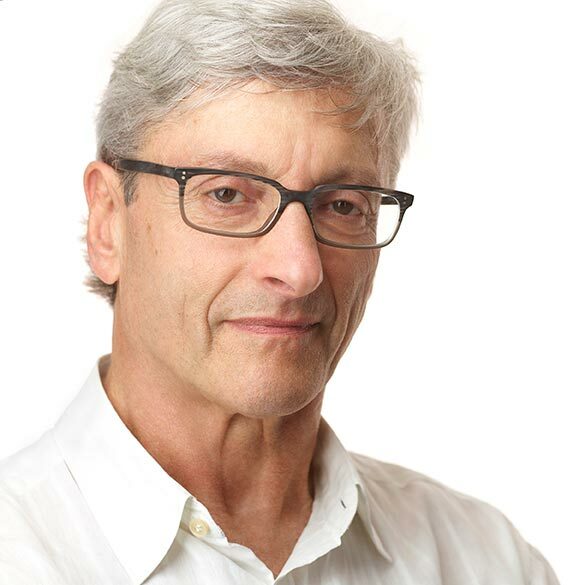 Over a career spanning nearly three decades and a wide array of themes in immunology, Littman has unraveled intricately braided molecular pathways that control the identity of immune cells, the specificity of immune responses, the ability of immune cells to turn against their hosts, and the interplay between immune cells and the human body’s microbial denizens. For his sprawling work on the staggering complexity of the immune system, Littman has earned many laurels, including memberships in the United States National Academy of Sciences, the National Academy of Medicine, and the American Academy of Arts and Sciences. Littman was born and raised in Bucharest, Romania in the 1950s, a few years before the harsh political regime of the socialist leader Nicolae Ceauşescu cast a bleak shadow over the Eastern bloc nation. Although his father was a physician and his mother an editor in a publishing house, it was his uncle, an engineer, who largely inspired Littman. From a young age, Littman grew increasingly fascinated by the mechanical marvels of industry and the inner workings of its machines. “My mother used to take me to the train station in Bucharest, and I would spend hours looking at steam locomotives,” Littman recalls. With the dawn of the space age and the launch of Sputnik, Littman’s interest in engineering deepened as he immersed himself in science fiction novels and resolved to become an aerospace engineer. Fleeing the harsh political environment in Romania, Littman’s family emigrated to the United States by way of France and Italy when he was 11 years old. After a brief sojourn in Rhode Island, the family moved to a quiet suburb of Philadelphia, where Littman completed high school. A standout in mathematics and physics, he promptly enrolled at Princeton University for a bachelor’s program in aerospace engineering. “But at Princeton I realized there was a whole universe of knowledge I had not been exposed to,” he says. In the summer of 1971, a year into his undergraduate studies, Littman chanced upon The Molecular Biology of the Gene, a gripping account of a growing field by James Watson and others that remains an unimpeachably authoritative tome decades after its first appearance. Smitten with the history of the field and the revolution it portended, Littman switched majors in his sophomore year, abandoning engineering in favor of biology. Pursuing his newfound interest, Littman joined the laboratory of cell biologist Marc Kirschner, then newly appointed to Princeton. With Kirschner, he carried out his undergraduate thesis, unraveling the mechanics of a molecule called tubulin, found in the scaffold that composes the backbone of all living cells. Energized by the experience in Kirschner’s laboratory, Littman considered a scientific career but faced a moment of doubt. “My father wanted me to follow in his footsteps, and I wanted to choose a safe professional path,” he says. So he took what he perceived to be the middle road: an MD/PhD program at Washington University in St. Louis, Missouri. The immediacy of medicine, coupled with the excitement of research, vindicated his choice. “It was tremendous to put together what I was learning from basic science in the context of disease,” Littman says. In a move that marks the beginning of his decades-long foray into immunology, in 1976 Littman joined the laboratory of a young immunologist couple, Benjamin Schwartz and Susan Cullen, who had recently arrived from the National Institutes of Health in Bethesda, Maryland, to launch a research group focused on the phenomenon of antigen presentation, which enables the immune system to recognize foreign antigens. Around this time, immunologists Rolf Zinkernagel and Peter Doherty had shown in Nobel-winning work that T cells of the immune system identify virus-infected human cells by recognizing both viral antigens and human proteins called major histocompatibility complex (MHC) molecules. But the precise mechanism used by T cells to sample the MHC–antigen complex remained a mystery. Schwartz and Cullen set Littman on an ambitious project to unravel the interaction, and he tore into it with the enthusiasm of a fresh-faced apprentice. “I had the naive idea that by putting the viral antigen and MHC protein in lipid vesicles and monitoring whether the vesicles trigger an immune response in T cells in lab dishes, I could unlock the mystery of the interaction,” recalls Littman. But the experiment was scuttled by a flaw he could not have foreseen. Because the immune system’s antigen-presenting cells display only portions of viral antigens—albeit embedded in MHC molecules—to elicit an immune response from T cells, Littman’s assay, devised using entire viral antigens, was doomed to fail; it would be a few years before the precise mechanism of antigen presentation came to light. Littman’s doctoral efforts may not have led to lapel-grabbing insights on immunity, but they sharpened his instincts, honed his technical skills, and prepared him for an obsessive quest to uncover the seemingly occult workings of the immune system. Decades later, the quest culminated in discoveries that transformed researchers’ understanding of immune responses and set the stage for experimental treatments for HIV. Toward the end of his doctoral studies in the late 1970s, a revolution in molecular biology was rumbling along, and Littman learned of a technical advance that enabled researchers to transfer genes into mammalian cells for fine-grained analysis of their functions. Sensing the terrain-shifting power of the technique, Littman began a postdoctoral fellowship in 1981 in the laboratory of Columbia University molecular biologist Richard Axel. In Axel’s laboratory, he set out to isolate the genes for MHC proteins, thanks to the advent of monoclonal antibodies, which can serve as baits to hook individual molecules on immune cells. But when a team at Harvard beat him to the finish line in the race to clone the MHC genes, Littman shifted his focus toward molecules on the surface of T cells that are crucial to immune recognition and response. Before long, his efforts led to the identification and cloning of two major proteins that confer immunological identity to the immune system’s foot soldiers: the protein CD4, which adorns the surface of helper T cells, and the protein CD8, found on killer T cells. The findings, published in a pair of reports in Cell in 1985, propelled Littman to scientific prominence. More importantly, those early years in Axel’s laboratory prepared Littman for the singular findings on HIV pathogenesis for which he is well known. By the early 1980s, researchers had found that the prime targets of HIV in the human immune system are CD4-containing helper T cells, and that the virus could glom onto CD4 molecules on T cells. But the precise handholds used by the virus to enter helper T cells were shrouded in mystery. Armed with gene-transfer tools perfected in Axel’s laboratory, Littman engineered mouse cells to express human CD4 molecules on their surface and exposed the cells to HIV. The cells shrugged off the virus, suggesting that HIV needed more than just CD4 for successful entry into cells. “That set us on the course to look for the additional components for HIV entry,” recalls Littman.